I love discovering new places and it amazes me some times, how much good food there is out there. Although ss3 in Petaling Jaya is not as glamorous as it's next door neighbour, ss2 which now seems to be packed with Hong Kong cafes for the yuppies, they get their fair share of customers due to their proximity to the factories. Food is always good around the area and cheaper than ss2. During lunch time, the little area is packed with people who flood there to eat at the Chinese and Indian places. My cousin who lives in ss3, recommended this place to us and it is ideal when you are feeling a bit skint just before your paycheck arrives at the end of the month. It ain't as glamorous as the banana leaf restaurants that charge you an arm and a leg as they serve simple food. Lunch is served from 11.3o am onwards and you choose what you want from a row of metal pots filled with all sorts of vegetables; potatoes, green beans, chinese cabbage, spinach, dhall and etc. They charge you according to what you take just like the economy rice outlets, but it ranges from RM4.50 to RM5.00. 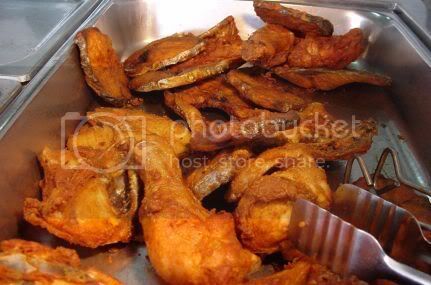 Here you have the essential fried items like fried fish and chicken. 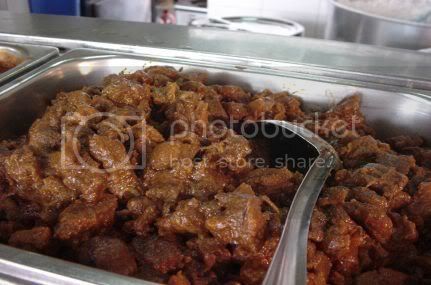 I love the curry mutton here, very nice and tender. Unfortunately I was a bit too early for it so I chose a different curry. I had a choice of three vegetables and a bit of chicken leg curry plus some crunchy poppadums with a glass of teh tarik (Malay for hot pulled tea) and it all cost me RM5 only! You see a stream of people coming to pack up curries including Indian housewives with their containers. They also serve breakfast like thosai and chapati in the morning. They are closed for a few days for Deepavali starting today. It's Halloween today so get out your costumes and remember to go trick or treating for some candy later tonight. 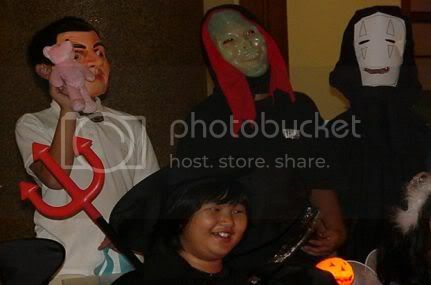 Every year, the kids at my place will dress up and go door to door to collect sweets. It is all organised by their mothers and extremely fun. This year, because of the double celebrations starting with Deepavali tomorrow and Hari Raya Adilfitri on Thursday, it is a long holiday and quite a number of people are away. 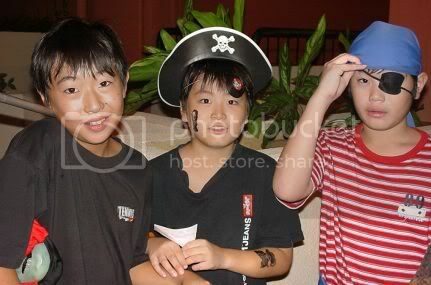 Hence they decided to conduct their trick or treat on Friday night. I managed to catch some pictures of them before I distributed them sweets. There were swashbuckling pirates complete with an eye patch and stripy t-shirt. Unfortunately no one had a spare parrot for him to borrow. Mr. Bean also came to the party and brought his teddy bear even though it wasn't a brown one. There were scary monsters with wicked laughter. The girls dressed up as witches with black hats and pumpkin lights. Have fun tonight and Happy Halloween! Hello everyone, I sneaked in early this morning to type this to get ahead of Mum! As kitties, we don't get much pocket money (everything is provided for) so it was a bit hard to come up with an appropriate present. I read that Kiri loves chewing cardboard boxes so I thought he would like his own mini cardboard box. 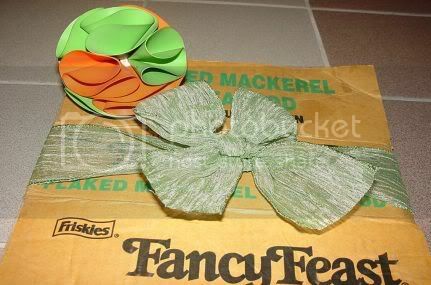 I stole a pretty ribbon from Mum's wrapping paper cupboard and tied the bow myself. It's a bit crooked as I don't have much experience tieing it since undoing ribbons is more my thing. 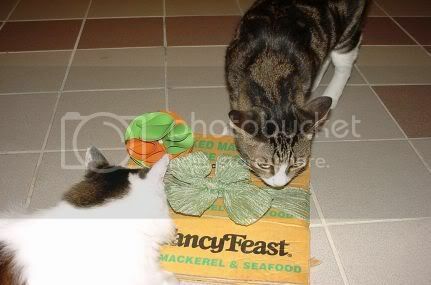 Sorry about the old cardboard box but that is all I found from the store room but it passed the sniff test as seen below. My sister, Ally decided to test it with me too and she gave her thumbs up, saying that if you sniff hard enough, you can imagine the yummy junk food we had before. I did a play test too and checked the underside of it and it worked fine. I also added a rubber thingamagig that we have. It is just a play ball that we love to paw around when we feel like being David Beckham. My only problem now is how do I send it to you? Is there special kitty kat post? Drats! I may have to ask Mum about that and I am sure she will say no but hey, it is the thought that counts, right? Oh! We also have something else to celebrate. 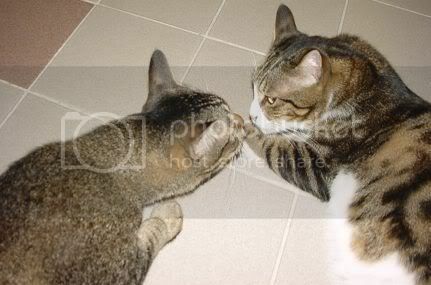 My brother, Kits kinda made peace with my sister, Ally. I really don't understand why they love to chase each other around. I never get chased around, just loved a lot by everyone. Think they both need to work on their cute skills. I better go before Mum wakes up to find out I did it again. She should know by now that I have more fans than her. I mean who wants to read about food all the time when there are more important furry things to care about, like me me me me! After reading Robyn's write-up on Dong Bei, we were all eager to try the Northern China food so a trip was made to the restaurant last weekend. We were not dissapointed as the food was fantastic. On the names of each dish, I hope I got them right as because I can't read Mandarin, I got my mother to translate the receipt. I messed up some pictures too so Shiewie was very kind to let me have her set of pictures (Thanks Shiewie!) so I will be able to present all the dishes we had. 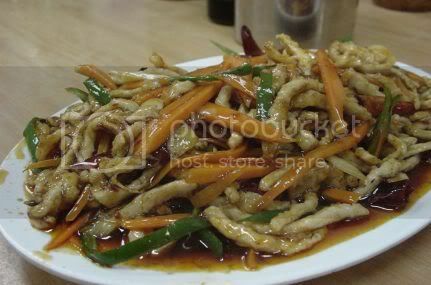 First off, was this dish of fish slices with red chillies (Yee Heong Yoke Siew in Chinese). There is a different description by Robyn but I thought they tasted more like fish shreds rather than meat so I am still in the dark on what it really is. Whatever it is, it is excellent and was the first dish that arrived on our table which we all tucked in. 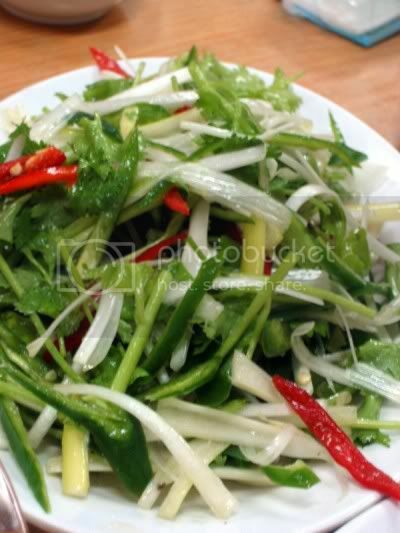 I love this salad, with the crunchy coriander, spring onion, green pepper and chillies salad. It has a pretty strange name as it is called Loh Foo Choy (which means Tiger's vegetables) in the receipt I have. Don't see any tigers lurking in that dish but who cares as the vegetables were excellent. 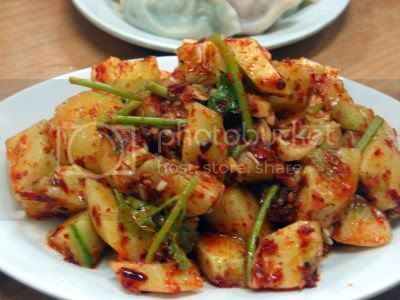 This is cucumber slices tossed in a sweet and sour sauce laced with chillies. Crunchy and flavoursome dish that was served cold. These bean sprouts are tossed in some old vinegar that made them slightly sourish but not too much. 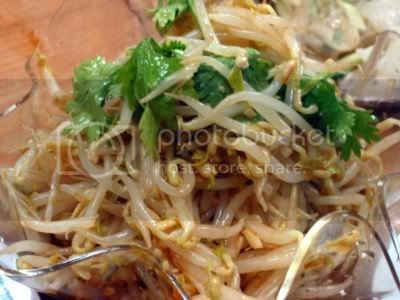 Great way to eat bean sprouts as it adds a subtle flavour. 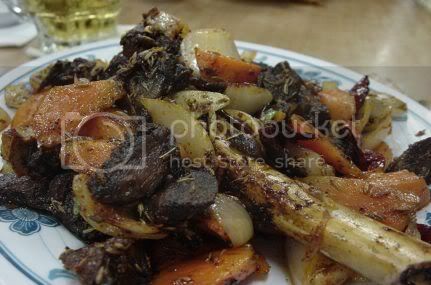 I liked this Lamb Leg (Yeong Toi in Chinese) dish that had chunks of lamb, carrots and onions dry fried with spices. You must eat Xiao Jiaozi (Little Dumplings in Chinese) when you are here, we ordered two varieties; a meat stuffed one and a vegetarian one with chinese chives and scrambled egg. 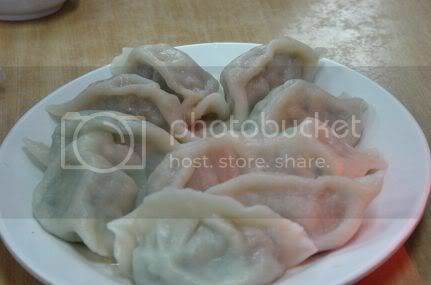 These dumplings hold a special meaning in my heart as my aunt in Hong Kong will always make them whenever we visit as she is from Northern China. This was smoked tofu fried with chilli which was also good. The smoked tofu was quite unusual as I have not seen them in that shape before. We also ordered the Lai Pi, the pulled mung bean threads tossed in a sauce of sesame paste, chilli oil, a touch of vinegar and coriander which came with a sprinkling of dried meat shreds. Lovely cold dish that went well with all the other dishes. 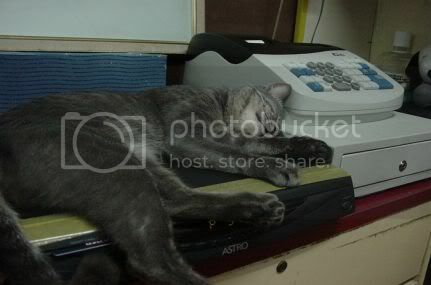 The people are Dong Bei are also cat lovers as we spied two of them wandering around but this fella was so cute as he was sleeping the night away on top of the Astro (satellite television) decoder next to the cash register that we took pictures of it. As it was the weekend, there were quite a few tables occupied and it looks like it was also a popular hangout for the local orchestra's musicians as there were two tables of them when we were there. Do pop into this place when you are in Pudu or if you hanker something different from the usual Chinese cuisine, drive all the way there, you won't be dissapointed. If you don't read Mandarin, you can survive with the picture menu. Last night, I felt like having something different so I scrummaged through my fridge and freezer for leftovers, surfed the Net a bit to get some divine inspiration and came up with this portobello pizza. 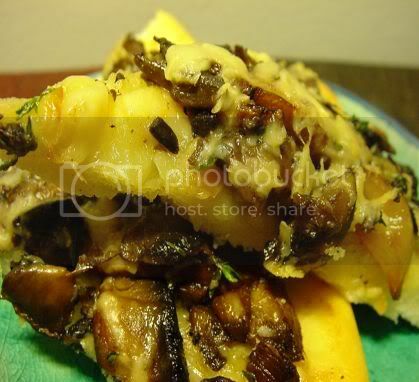 Not sure if you notice by reading my blog but I love mushrooms of all kinds plus cheeses of all tastes. There is always a chunk of parmesan and cheddar cheese in my fridge especially for those cheesy moments. Another thing I absolutely love is roasted garlic, I'll add them anything I roast and savour their sweetness with the dish. This portobello pizza was inspired by a description of California Pizza Kitchen's menu that featured a pizza made from portobello mushrooms, thyme and roasted garlic. I suspect this pizza is out of commission as their recent menus only have a mushroom variety pizza. No mention was made on what cheese they used, so I added parmesan as I don't really like the taste of mozzarella. If you wish to recreate this portobello pizza, it's pretty simple. All you need to do is first, roast your whole garlic cloves with a drizzle of olive oil in an oven for about 40 minutes (the oven should have a temperature of 200C). When done, remove the skins and press the garlic puree on the pizza base to smear them. Reserve some whole cloves to toss them with the mushrooms. Slice the portobellos, I even used the stems which I diced and fry in olive oil plus butter. Let them cook a bit and sprinkle sea salt and black pepper to taste. Add fresh thyme leaves which will give your mushrooms a lovely flavour. Remove from pan and sprinkle this on top of your pizza base. Grate some fresh parmesan on top (I did not use much, just a bit as I wanted the mushroom flavours not to be overwhelmed). Heat up oven to 220C and cook for about 25 minutes or until crispy. Serve piping hot. I suspect not many people will like this kind of pizza as Malaysians tend to love the American kind with lots of tomato sauce plus stringy mozzarella cheese but for me, it was heaven since it combined all my favourite flavours: the meaty portobellos, sweet roasted garlic, aromatic thyme and parmesan cheese. Sorry for the quite ugly pix as I still have not figured out how to photograph pizza! It's either the flat whole look or the slices which I decided to do so it kinda looks messy. I have read quite a bit about this place in the papers and on the Fried Chillies forum but only managed to get to eat it last week once I found out where exactly it was located in SS2. The original shop is located at Prai, Butterworth but they have branches all over Penang, Subang Jaya, SS2 in Petaling Jaya and even one in Indonesia. It's a family business run by a group of siblings continuing their father's legacy. This Teo Chew restaurant's signature dish is the Mee Sua Tow, where they cook mee sua (a thin longevity noodle) in a seafood based soup that is thickened with potato starch and chock full of seafood like fish, prawns, crab sticks, fish maw and sea asparagus. 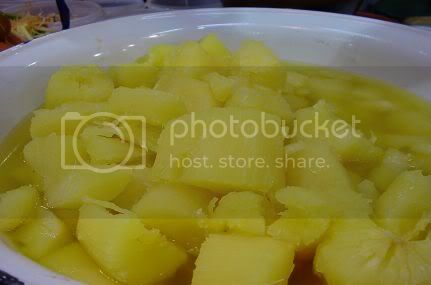 The ingredients tend to differ a bit for each portion served as I have seen shark fins in someone else's pictures but the portion we got did not have any. It is essential to eat this with some Chinese black vinegar. 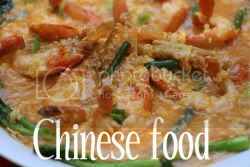 This dish is said to originate from the Fuchow area in China and was introduced by the founder of this restaurant. We added a bit of the sambal belachan into the soup and it tasted even better with a slight chilli taste to it. 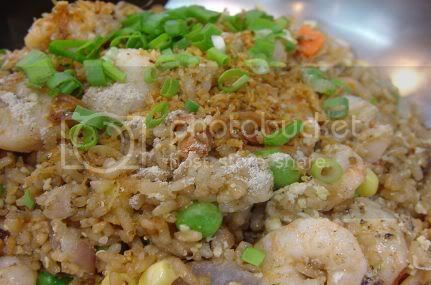 We ordered a Seafood Fried Rice which came with lots of prawns inside it. 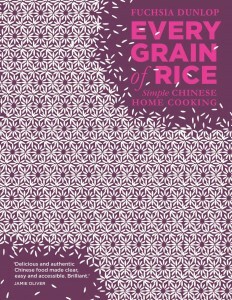 The rice was very tasty and aromatic. 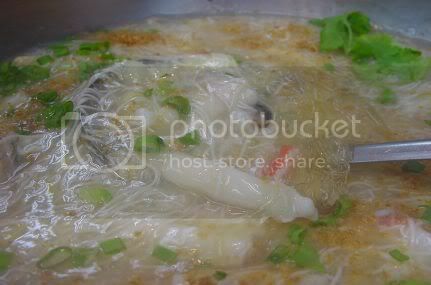 They served this in a metal pot that is also used for the Mee Sua Tow. Besides that, we also had the Seafood Roll which is like the Penang Lor Bak, a stuffed bean curd skin (Foo Chook in Chinese) roll filled with minced seafood like shrimp, mantis prawns, siakap fishm crab meat and cooked salted egg yolks. 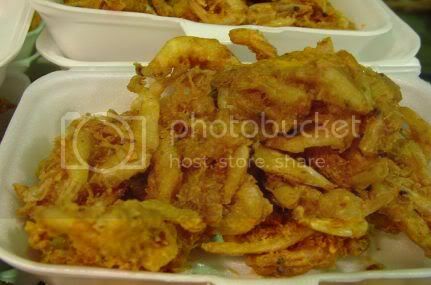 Not too bad and they cut up the Lor Bak and fried each cut portion individually making it extra crispy that the normal Lor Bak. 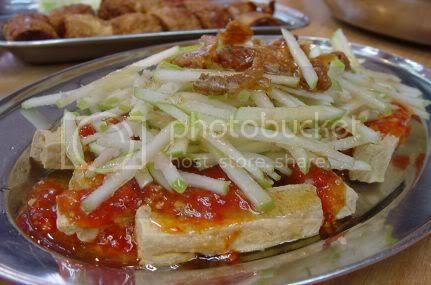 I liked this dish a lot, the Apple Tofu which was made of fried tau kwa (dried tofu) strips, shredded green apples tossed in a Thai chilli sauce with some plum sauce. The dish was sprinkled with some deep fried tiny prawns (Har Mai in Chinese). 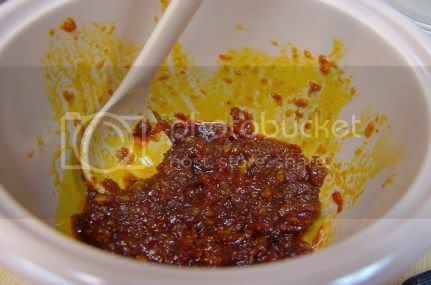 This home made Sambal belachan was very nice with the Mee Sua Tow and Fried Rice. 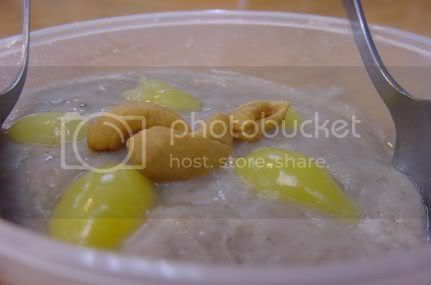 We also ordered one portion of this Teo Chew dessert called Or Nee that is made from yam. They added gingko nuts and cashews on top. It's my first time eating Or Nee but my companions said they have tasted better. The plus point is this version is not that sweet. I suspect they make it ahead and packed in this plastic container. It is then microwaved to heat it up. Besides these dishes, they also had mango kerabu, seafood porridge using the same stock as the Mee Sua Tow, fresh octopus salad, three taste oyster (sweet, sour and salty), tom yam noodles and clear soup noodles. The place was quite full of people even during the weekday. Although people rave about the food quite a bit, I thought the food was only okay, nothing that really wowed me or my fellow Hokkien lunch partners. The only dish that I really would not mind coming back for was the apple tofu plus the yummy sambal belachan they served. Another factor to consider would be this kind of food with all the seafood is not cheap as that meal costs four of us approximately RM70. I stumbled across this Thai fair called Mini Siam at Mid Valley Megamall which is on until 2 November, 2005. This group of Thai traders usually move from mall to mall setting up stalls to sell their food and Thai produced items. It has been quite a while since I have been to one so it was great fun to look at all the food plus browse through their items. I saw some beautiful woven baskets which I was tempted to get for keeping magazines and what nots. However I suspect if I get them, the cats will decide that it is fun to sleep in them instead! There are two stalls at the far end of the fair selling cooked food with chairs and tables placed behind for people to eat their ordered food. The first stall(nearer to the massage stall) was doing brisk business. This caught my eye, the Thai Ice Cream which looked like an ice lolly made from popular carbonated drinks in multi-coloured hues. 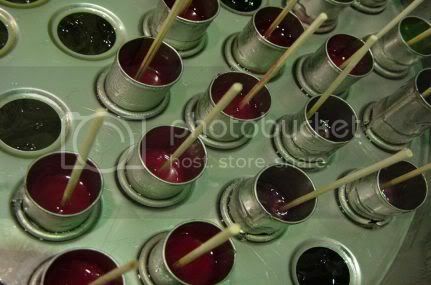 You can see how they freeze the ice lollies in a this metal contraption with ice cubes underneath the molds. They had ready packed these deep fried tiny prawns which looked good and would go wonderfully with some Thai Laksa. 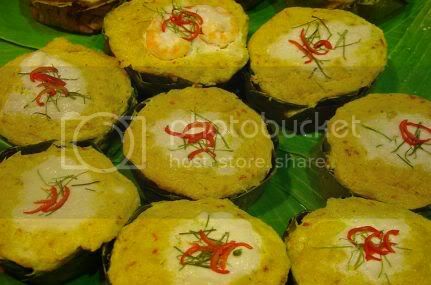 Then there was this creamy looking steamed fish cakes which we know as Otak-otak in banana leaf cups. There is a bit of coconut cream on top with a prawn and shreds of kaffir lime and chillies. 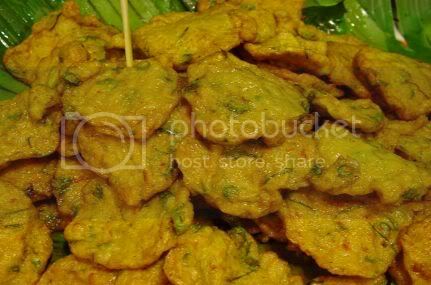 These are deep fried Thai fish cakes which is made from fresh fish, red curry paste and chopped coriander and lemon grass. 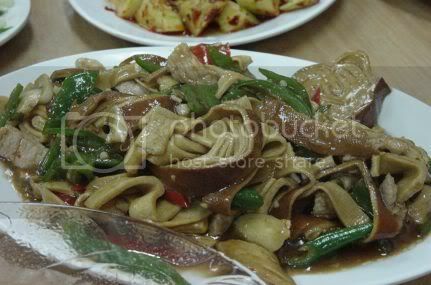 This was extremely popular, the noodles that quite a lot of people were ordering. 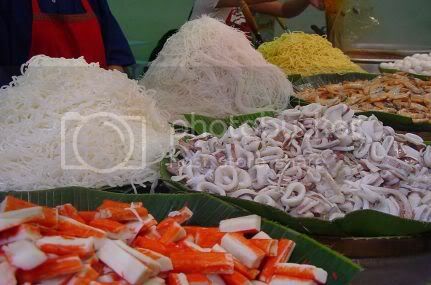 They had stacked the different varieties of noodles; beehoon, yellow mee, laksa noodles, kuay teow in front for people to pick their own preference. You can also choose the seafood and vegetables you wish to add to your laksa. 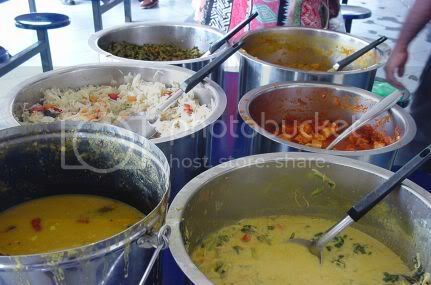 Once you have chosen, you hand over the bowl to the person behind the counter who will cook and ladle the soup into it. This was the tomyam soup they had on boil in a huge rice cooker which they will add to your laksa items once they have been cooked. 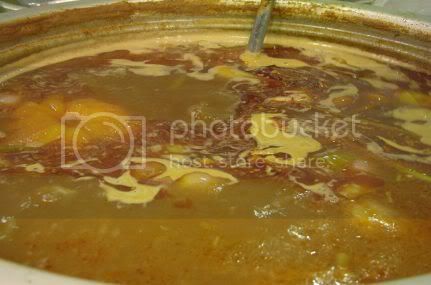 They kept pouring in the stock from another large rice cooker to top up the soup. Another large rice cooker had boiling water for them to cook the noodles in. A very popular dessert, steamed tapioca. I am not a great fan of this so I am not sure if the liquid below is actually just the tapioca juices or a sugar syrup. This is what I like, the mango glutinous rice. They had two varieties of rice, one white and one green which I suspect is just tinged with a bit of pandan extract. You can't really tell the difference. 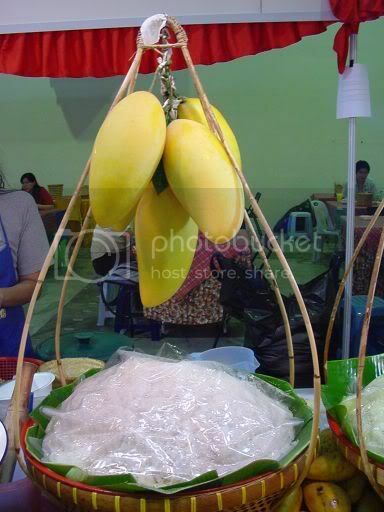 I ordered one to take away and it was yummy with a bit of coconut cream on top to accompany the rice and sliced mango. 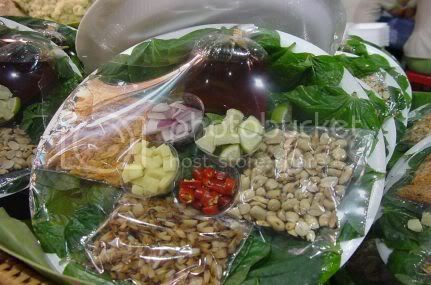 The other stall was selling an exact replica of the food items in the first stall but they had something unusual which was pre-packed Mieng Kam, a kind of appetizer which is getting popular in Thai restaurants. You add chopped chillies, lime segments, toasted peanuts, ginger chunks, chopped onions, fried tiny prawns and toasted coconut on top of betel nut leaves and fold them to eat. 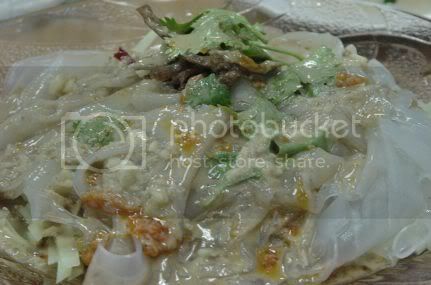 A sweetish black sauce is also added into that concoction before you fold up your betel nut. 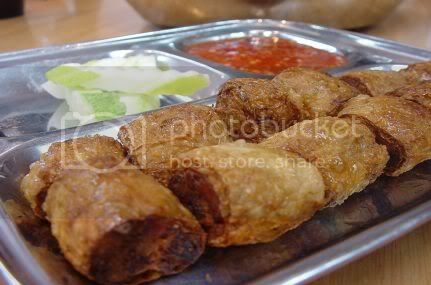 This is one of my favourite street foods and I have fond memories of this old lady folding them into triangles poked in a bamboo skewer for sale in Chatuchak Market. 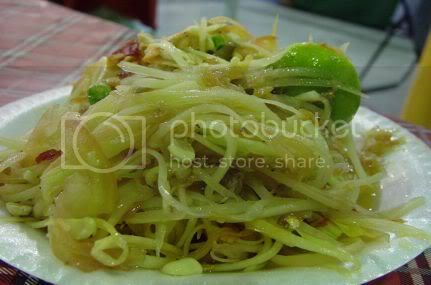 I chuckled a bit when I saw the mounds of grated green papaya and grated green mango that were for the som tam and mango kerabu as this was also my favourite. I ordered one portion to try at the stall and the lady pounded it up in her wooden pestle and mortar. This was my som tam, that came in a huge mound of shredded green papaya, toasted peanuts, shredded chillies, sliced tomato, lime juice, fish sauce and tiny prawns. It was pretty fiery that brought tears to my eyes but I liked the taste. Unlike the one we tried in Songkhla Hawker, this one does not have a strong taste of fish sauce. 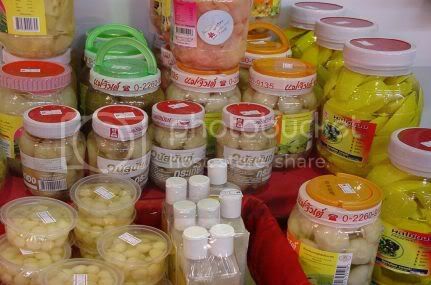 There was a stall selling all kinds of Thai food items including jars and jars of pickles. 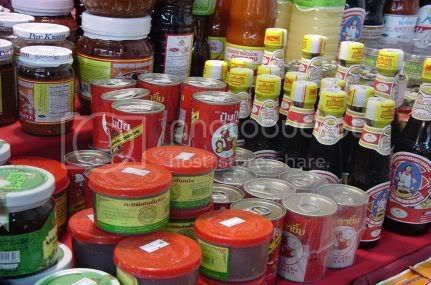 They also had the Thai sauces and curry pastes for you to cook up a Thai meal at home. Besides these condiments, they had stacks of tomyam instant noodles for sale. 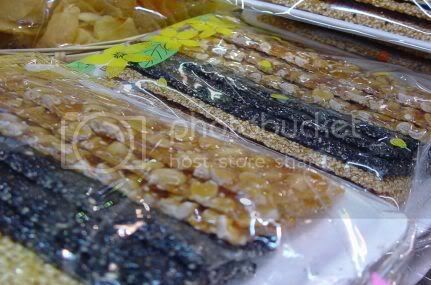 This three variety sweets are extremely popular in Thailand and you see them sold everywhere, the first one is a sesame seed candy, black sesame seed candy and the last one is peanut candy. 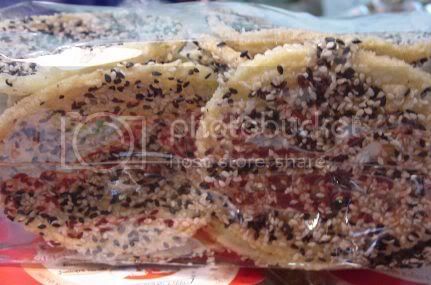 You can also buy packets of just the sesame seed candy or black sesame seed candy. 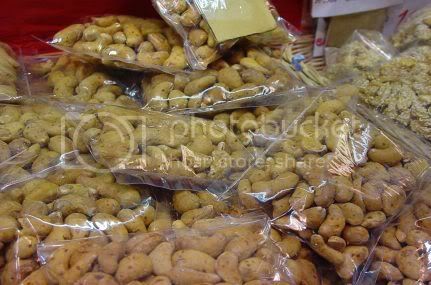 Thailand is a great place to get cashew nuts and everytime we make a trip there, we will buy loads of them to bring back as they are cheaper than the ones we get in Malaysia. Something unusual that they were selling at this stall are these tom yam cashews. They had sprinkled some black and white sesame seeds on these crackers. Usually the popular crackers are those sprinkled with pork floss. 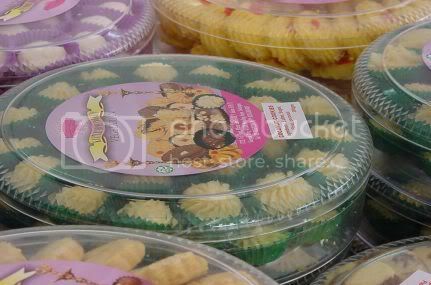 You get quite a variety of durian desserts in Thailand and they have this durian cake and even durian sweets. Besides these items, you can also get a large selection of dried fruits including my favourites, dried longans. I will either eat them as a snack or boil them to make desserts. This is pretty popular among Malaysians, the foot reflexology and thai massage stall. They also have private cubicles for the Thai massage. To be honest, I have not tried the reflexology before, I get a bit ticklish at my feet but from what I can see, they will add cream on your foot and put the cloth over your foot and massage it. Last Friday, we managed to get together with friends including Tepee for a bit of buka puasa at Rebung in Bangsar. This place is a new joint opened by Chef Ismail, a local celebrity chef who has his own cooking show on local television. 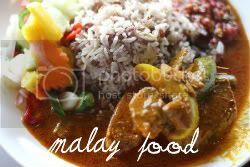 Previously he had a stall located within the Bangsar Shopping Centre's food court. I confess I did not take a single picture that night and Tepee was happily snapping away so I will feature her lovely pictures that she took (Thanks so much Tepee, your pictures are fantastic!). We got there way too late, after it was buka puasa time since traffic was a bit heavy so most of the food had dissapeared from the serving trays. For those who have not been to buka puasa buffets, usually people come early to take their food and wait for the buka puasa time hence if you are late, most of the nice stuff is gone. Let me recall what we ate that night which was memorable. The dish that stood out that night was this gulai tempoyak paku-pakis. 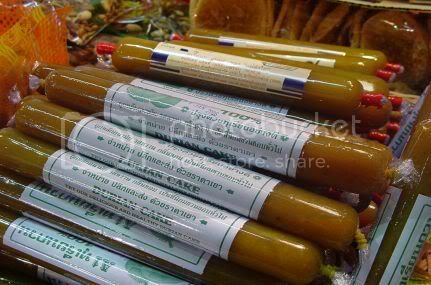 Tempoyak is made from fermented durian flesh and chillies which they cooked the paku-pakis (Malay for ferns). It was creamy and pungent with the smell of the durian plus spicy from the chillies. They also added petai beans in the curry. 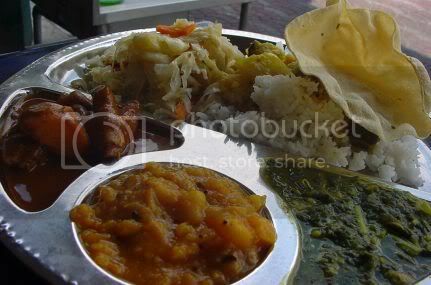 That was the favourite dish among all of us and we all took large helpings of it. The bergedel was also good, made from potatoes and deep fried. These ones were tinier than normal but simply delicious. To name a few that I remember, there was ayam masak merah, grilled fish, various ulams and gulai nangka. Some of the food items were spicy especially the kerabu kacang botol (Malay for four angled beans) that really floored me. We also had continous flow of rose syrup with selasih (Malay for basil seeds) and cincau (Malay for grass jelly) to drink the whole night. There was also some very nice Teh Tarik (Malay for pulled tea drink) and Ais Kacang plus various kuih-muihs (Malay for cakes) to finish the meal with. Last but not least, there was even two men entertaining us with some music. If you fancy Malay food and want to catch some before the end of puasa (next Thursday), do give Rebung a try. Booking is essential and do remember to be early! Time flies and next week will be the start of the Deepavali celebrations. Places are packed with people doing last minute shopping especially at the Masjid India and Brickfields areas. Recently, I visited the Brickfields area and found a totally different atmosphere from Klang. Most of the Brickfields stalls are temporarily set up specially for Deepavali just between the KL Sentral train station and the KL Monorail station. The area gets quite a bit of walk through traffic and everyone takes that route if they are changing from the Light Rail Transit ("LRT") to the monorail. At these stalls, you don't see much food items and I counted two sweet stalls, one muruku stall, one cookie stall and an area where they were serving Indian food. A little birdie told me that the briyani they serve there is superb. 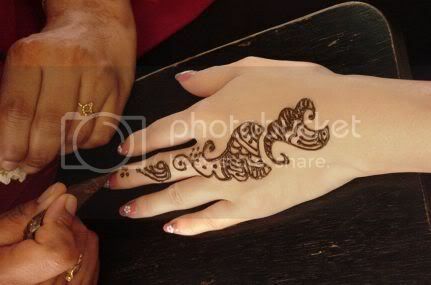 This was pretty popular with the ladies, applying mehndi on your hands for RM5. You can see the lady painting an intricate pattern with henna on this Chinese lady's hand. Traditionally used on brides during Malay and Indian weddings, applying mehndi has become popular as a decoration nowadays. Henna is mixed into a paste with sugar, coffee, tea or lemon juice to release the dye. Usually the design lasts for two weeks fading from the dark brown to a light orange before dissapearing. The area has two kinds of stalls, open aired ones and air-conditioned stalls within a bigger tent. There is also a stage where Indian dancing and singing performances are staged at night. 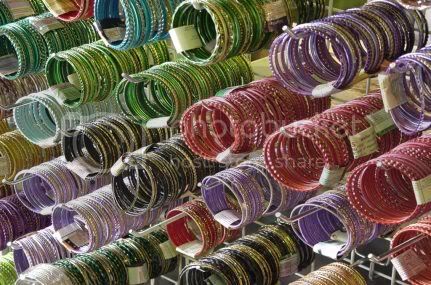 I wandered into the air-conditioned area and found lots and lots of different bangles including these multi-coloured ones that were so pretty. Usually you buy them in pairs and the different colours will match the hues of your sari. They are essential in Indian jewelry and the popular ones are gold bangles as they make a nice jingling sound when you walk around in them. 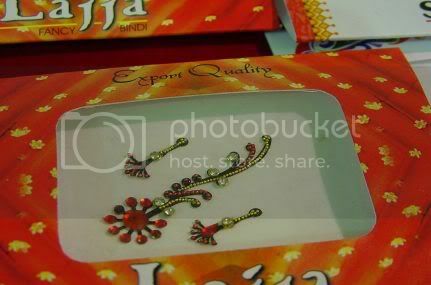 The stalls were also selling various decorative items like this intricate looking bindi for the celebrations. Literally meaning "dot" in Hindu, it is traditionally felt that the bindi protects a woman and her husband. Nowadays it has become more decorative and grown beyond just a dot to intricate designs similar to this one. This was the lone stall selling nuts and savouries for the celebrations. 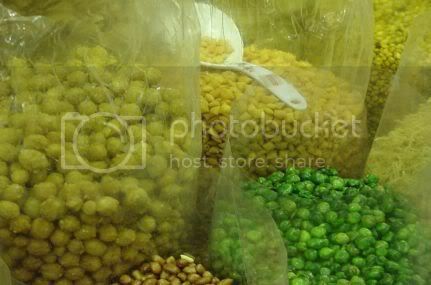 He had rows and rows of these bags filled with various items for sale including the hard green peas. Most of the items at these stalls are brought by their India stall owners and the varities are different from the Little India in Klang. My favourites were these beautifully designed cloth in wonderful hues that one can use to make anything you like. Nowadays not only do women buy them to make saris, you can also use them to make Malay baju kurungs and even modern outfits. I was tempted to buy this particular one as I love the colour. 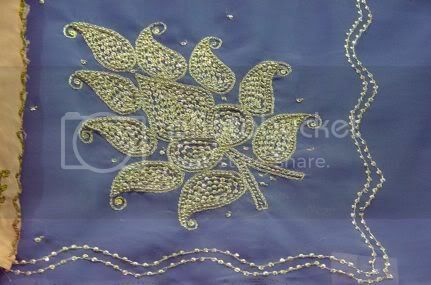 They also had ready made clothes for the celebrations which were beautifully decorated with beading. 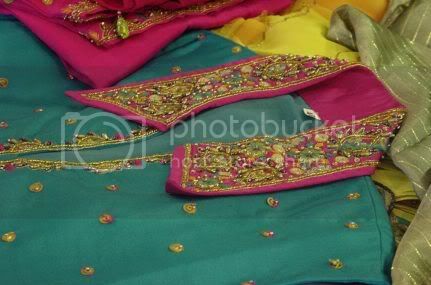 This was also another favourite of mine, a turquoise salwar kameer with a bright pink and beaded collar. On to the food, not much but I did snap some pictures of the stalls and this was interesting, Thai Bahulu which was made in a machine similar to those kaya balls. 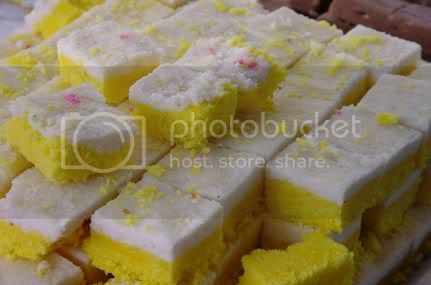 Bahulu is more of a Malay snack which is akin to a plain sponge cake with a crispy top. 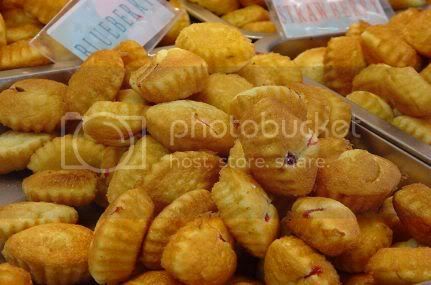 This Thai version had different fillings in them like strawberry and blueberry. Highly unusual but I am a traditionalist as I prefer the old fashioned bahulu instead. There was also a stall selling pitaya (dragon fruit) juice in cans that looked interesting too. There were various sweets being sold in stacks around this stall. This is the same one that Robyn visited and had blogged about earlier. 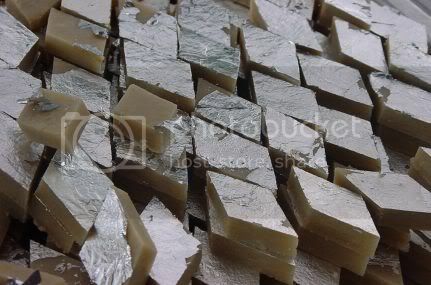 These are extremely popular, a type of barfi made from milk and layered with silver foil for the festive season. I usually buy the plain ones as I love their milky taste. 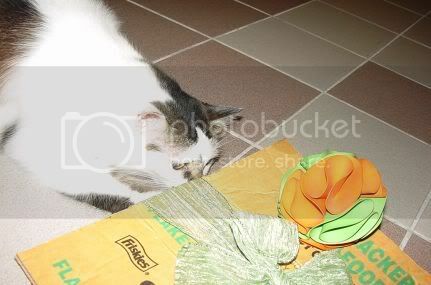 Even my cat likes to sneak a bit of it. I did not ask what kind of sweet is this but it looked like it has a coconut base and was something unusual. 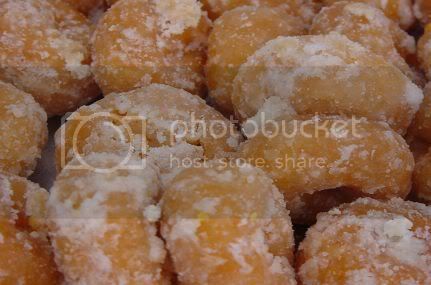 These are known as punjabi doughnuts with a coating of sugar. 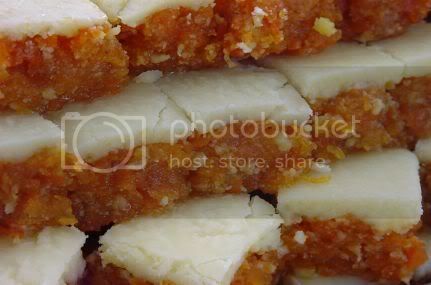 Looks quite similar to the malay version called kuih keria. I also found a cookie stall which sold vegetarian cookies for the festive season. I wonder what is used in them as they look exactly like ordinary cookies. 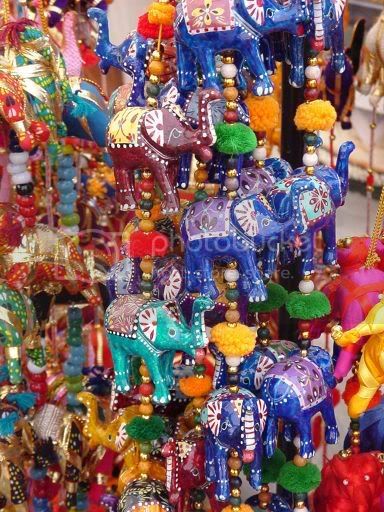 Besides clothes and food, they also had lots of decorative items and I kept seeing strings and strings of little elephants. The best ones were these, that were painted with bright colours and designs that I so wanted to get! IMBB 20 - Has My Blog Fallen?